Strawberry Angel Cake makes an easy, elegant dessert recipe perfect for entertaining or enjoying with your family. As the weather gets warmer here in the south, I try my best not to use my oven as much. But, I still want to serve delicious desserts when we invite friends over for supper. Enter this Strawberry Angel Cake. This is a dessert that my Mama made during the summer when I was growing up and one that I hadn’t made in a long while. We had invited Mrs. Melba, the lady who kept Little Buddy when I worked, over for supper one night this past week and I wanted to make a simple dessert that I felt sure she would love. I remembered how much she liked strawberries and I knew she loved the lightness of angel food cake. Rather than serving a fussy dessert, I knew this strawberry angel cake would be light, refreshing and ultra easy to prepare! You just won’t believe how easy it is! Or delicious. I used Sugar-Free Cool Whip to make this recipe even quicker and easier, but you could easily use homemade whipped cream if you prefer. Strawberry Angel Cake makes an easy, elegant dessert recipe perfect for entertaining or enjoying with your family. 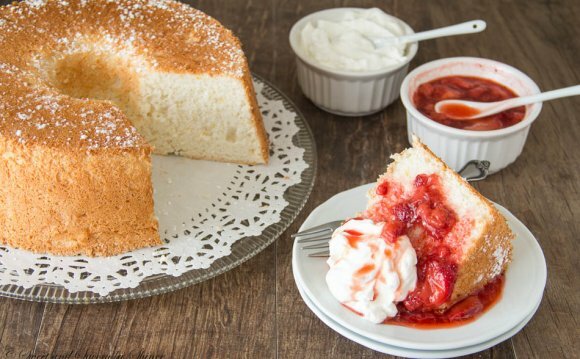 Get this simple, no bake strawberry angel cake recipe. Slice the cake in half and spread a layer of Cool Whip or whipped cream onto the cake layer. Top it with a pint of sliced strawberries and then place the top half of cake on top. 'Frost' the cake with Cool Whip or whipped cream. Place into the freezer until right before ready to serve. Slice with a serrated knife for serving.